This is our Sheep / Goat Nose. Like most of our pieces, this prosthetic appliance was made to fit most faces. 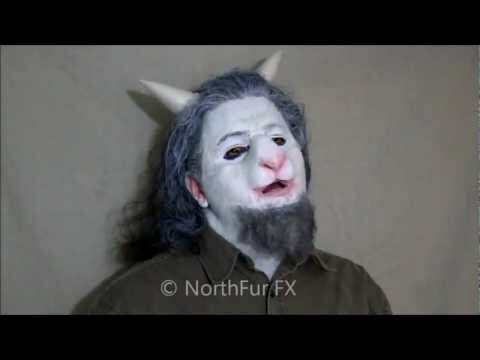 The main picture above is the hot foam latex version applied and painted in white as a goat. This compact nose is modeled after a sheep. The bridge of the nose is long and wide with the nose pushed down low to emulate the large muzzle sheep and goats have. It can be useful for any breed or color of sheep or goat and horns and ears help to define the character. Paint it in white, greys, browns or flesh tones. It is one piece and comes unpainted by default. Teeth, contact lenses, ears and other prosthetic pieces other than the Sheep / Goat Nose that are shown are not included. Using these types of costume accessories can help accentuate this prosthetic piece's features.